From what I can gather West Hams badge has remained pretty much the same since its introduction, unfortunately though I havent got any definitive dates so Ill just concentrate on its background. 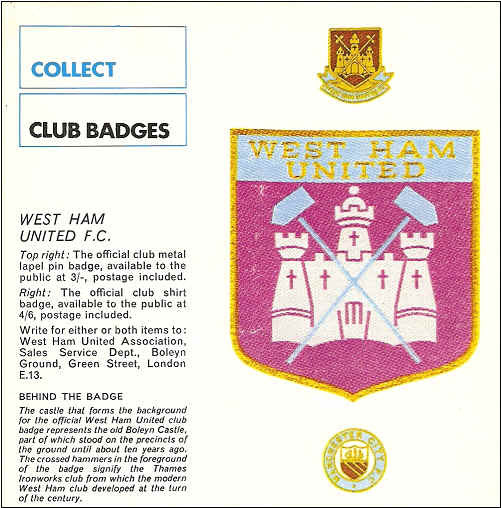 Obviously the most common association with West Ham Football Club is the crossed Hammers, these apparently were the only items on the original badge. I cant find an image of this badge so if anyone has one please get in touch and Ill add it. 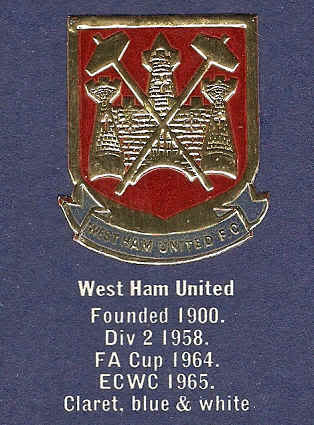 The reason of course why the Hammers was taken as an emblem was down to the fact that West Ham were formed as a result of Thames Ironworks FC disbanding. 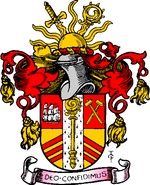 Some people believe that the Hammers emblem was created at the same time as the team, however in fact they were taken from the West Ham Coat of Arms, this Coat of Arms was granted in 1887 so predates the football club by a good number of years. As you can see the Hammers are in the top quarter of the shield and referred to the ironworks industry of the area. Another couple of less believable theories exist about about the reason for the introduction of the castle, the first being the fact that several players from Old Castle Swifts were part of the old Thames Ironworks / West ham team. The second is that West Ham adopted Boleyn Castle FC as their reserve side. Either way the football club kept the same badge until the late 1990s when it was redesigned slightly, below is a couple of examples of the original badge. The first is from the 1959 Encycolpedia of Sport. The badge below is from the Esso Football Badge collection that was issued in the early 1970s, we actually have these in stock on our Footybits site here. Another version of the badge is from the 70s is shown here as it was featured in the Football Review magazine. The late 1990s redesign involved a widening of the castle with fewer windows and the removal of the peaked roofs. 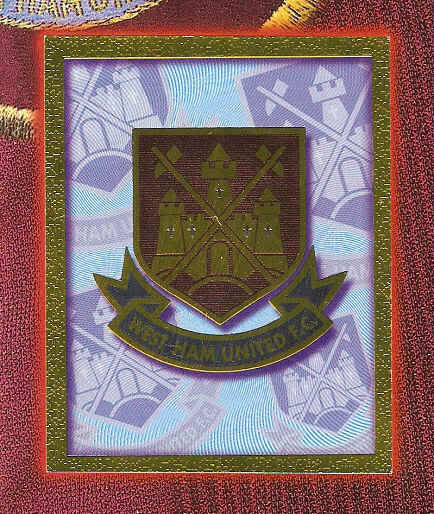 Above is a nice example of the current West Ham football badge which has been taken from the Merlin 98 football sticker album. So there we are, a short history of the West Ham football badge, of course if Ive got anything wrong please feel free to drop me a line and Ill get it updated straight away.